A bitter battle between rival coal mine unions, a battle that began and effectively ended in Springfield, led to strikes, bombings, street riots and at least six killings in Sangamon County in the 1930s. The United Mine Workers of America, headed by a sometime-Springfieldian, John L. Lewis, held contracts with most local mines, in particular those owned by the giant Peabody Coal Co. However, with the onset of the Great Depression, negotiators for the Illinois UMWA in 1932 were forced to accept a cut in miners’ base pay, from $6.10 a day to $5. Outraged miners overwhelmingly defeated the pay cut in July, forcing Lewis to schedule a second vote in August. Although Lewis campaigned in favor of what he said was “every concession that … can be wrung from the impoverished coal companies in a stricken and almost expiring industry,” central Illinois miners seemed certain to reject the pay reduction again. On Aug. 10, as two UMWA leaders were taking the tally sheets to the union’s Springfield headquarters, they supposedly were accosted on South Sixth Street by two armed men who demanded the ballots. However, a miner/poll watcher who saw the incident told a different story: He said the ballots actually had been delivered into a car driven by a UMWA vice president. That afternoon, Lewis declared peremptorily that “the officers are of the conclusive opinion that the agreement was ratified by a majority of the membership.” He quickly approved the $5-a-day contract. Feb. 14: An explosion at the home of a UMWA miner near Devereux Heights (northeast of Springfield). Feb. 18: Bombs go off at two homes, one belonging to a miner, one to a former miner. And “the fourth mysterious explosion in 27 hours” demolishes a house at 805 E. Miller St. belonging to a PMA miner. Three residences bombed Friday night and Saturday morning were all UMWA homes. Also, 10 bullets were fired through the window of a home on 10 1/2 Street, and five shots hit a vacant house on Clear Lake Avenue, apparently fired at miners living nearby. Feb. 23: Violence continued at the Peerless mine. A special deputy sheriff, one of 100 sworn in for mine duty, was shot and hospitalized as PMA pickets attacked a carload of UMWA miners leaving the mine. Hundreds of pickets lined the lane between the mine and Sangamon Avenue, and large crowds also picketed the Woodside and Capitol mines. Feb. 24: Gov. Henry Horner ordered three companies of the National Guard to patrol local mines, while four Peabody mines in Springfield were ordered closed. The most serious clashes took place at the Capitol mine, where an estimated 1,500 PMA pickets gathered. During a half-hour melee, a picket was shot through the cheek, a Springfield police officer and two deputies were injured by flying bricks, and three working miners and another picket also were hurt. Elsewhere the same day, windows were shattered and the foundation damaged by the bombing of a UMWA miner’s house on North Grand Avenue. Feb. 25: Two more homes bombed. Feb. 27: Another bombing and a late shooting report appear in the Journal. Art Gramlich (1904-73), a PMA miner who was shot nine times in various confrontations with union opponents, later described the environment during the worst of the intramural violence. The following is from a 1972 oral history interview. We had quite a few scrimmages, no doubt about it. There was a lot of street fights and gun fights. Several times I came out on top, more than I didn’t (laughter) but I’m still here. We tackled them on the streets or around taverns at night. At out-of-the-way taverns, you know, you would walk in where they was at and right away you could smell them and you let them know that they had a certain odor about them and, goddamn, the hell would start. Sometimes you got the s— knocked out of you and sometimes you didn’t (laughter). It was common — well you thought half of the goddamn miners in Springfield were Jesse James or cowboys, they all packed their goddamn gun in their belt. The police wouldn’t do anything too much to you. It was to survive, that’s all. It was survival of the fittest because it was pro and con, you see. I don’t want to sit here and brag, but I survived nine bullets of which I still carry two. So you can see how easy it would be for a guy to get shot because there’s plenty more around here just like I am and there’s plenty more around here just deader than hell, too. They just didn’t have a chance. A complete list of those killed in union battles in Sangamon County isn’t readily available. The media-savvy PMA compiled a fairly complete martyrology, but no similar registry appears to exist for the UMWA or for non-union casualties, and no researcher has undertaken a systematic search of local newspaper archives to compile one. At least two non-PMA deaths can be attributed to the mine union rivalry in Sangamon County, however, and another UMWA miner was shot to death in a riot in Kincaid in 1933. *Springfield Police Detective Sgt. Porter Williams, who was shot to death during rioting on Sept. 25, 1932. His assailant was never identified, and it is not known whether Williams was killed by a PMA or UMWA partisan, but 25 UMWA members reportedly were arrested during the disturbance. *Tom Urban, a PMA miner shot during another round of rioting at the Peerless Mine on June 7, 1933. As in February, UMWA miners going to work met hundreds of Progressive miners lining the roads and throwing sticks and stones at the UMWA miners. *Melvin Staples of Taylorville, shot on Oct. 19, 1933, by Peter Haines, also of Taylorville, in front of 108 S. Eighth St. in Springfield. Haines, former president of the Kincaid UMWA local, said Staples was among a group of men who accosted him in front of a barbershop and struck him in the head with a rock. Staples was on strike with the PMA. *Security guard Robert Blaine Cox of Barclay, killed “in a shooting affray” at the fan house of the Woodside Mine at 15th and Cornell Streets on Jan. 27, 1935. A group of PMA miners reportedly “had been hanging around a beer parlor across the street all afternoon and numerous times flashed their guns,” the Illinois State Journal reported. When Cox crossed the street to arrest the men, he was shot in the head by “a bullet fired by an unknown member of the group,” the newspaper said. Editor’s note: Some accounts give Cox’s first name as William or Charlie. SangamonLink thanks Cox’s great-granddaughter, Gaile Bee, for confirming his full name (see comments). Three PMA miners — Art Gramlich (who was wounded in the incident), Edris Mabie and Dan Mataya — were arrested in connection with Cox’s killing, but a grand jury in April declined to indict any of the three. *Edris Mabie (top photo), one of the Cox shooting suspects, himself was shot to death at Sixth and Washington streets on Easter Sunday, April 21, 1935. A PMA meeting and Easter party had just ended. Mabie was among a large group of PMA miners near the intersection when a car occupied by UMWA partisans, traveling south on Sixth, collided with the car in front of it, then backed into the car behind. As PMA miners surrounded the cars, both sides began shooting. Mabie was killed, and Art Gramlich was badly wounded. 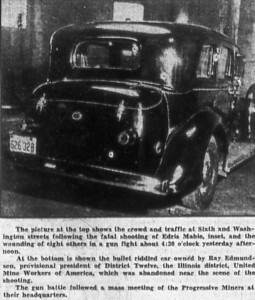 Those in the car included UMWA Illinois president Ray Edmundson, along with Fred Thomasson, a cohort of southern Illinois gangster Charlie Birger. In a vivid story, the Illinois State Journal reported the shootout. Suddenly, witnesses said, the opposing groups seemed to come together. Guns roared. Mabie fell forward, mortally wounded. He died almost immediately, in the middle of the street. Gramlich, also in the street, dropped to his knees and rolled over on his back. There was a wild, mad scramble as the shots, possibly twenty, were fired, and persons on the sidewalks fled to safety. Stores that happened to be open — for the most part beer parlors in the vicinity — were stormed as they afforded the only refuge. No one was ever charged with Mabie’s killing. 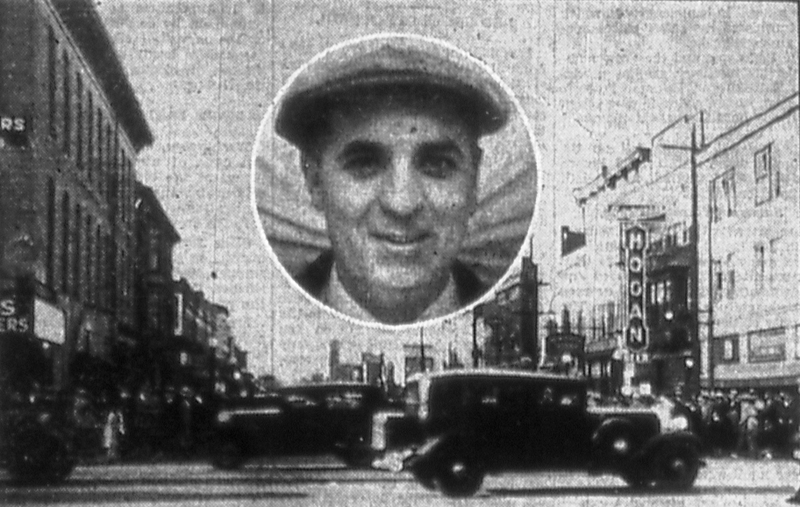 *Fred Gramlich Sr., shot to death in the tavern he ran at 18th and Ash streets on May 27, 1936. Investigators theorized the gunman mistook Gramlich for his son, Art. The crime was never solved. *Vincent Rodems, 20, of Springfield was killed in a gun battle involving Progressive miners, mine guards and special police in Kincaid on Jan. 3, 1933. About 150 Progressive supporters, including women and children, were picketing a Peabody mine near Kincaid when gunfire broke out. Rodems, a UMWA member working at the mine, was shot in the melee, as was Emma Cummerlato of Kincaid, who was watching the picketing from a nearby porch; she was later hailed as a Progressive martyr. Among those charged with shooting Rodems was Kincaid Police Chief Albert Mattozzi, a Progressive supporter. In April, Mattozzi was acquitted of killing a mine guard on Jan. 4, the day after the riot. It can’t be determined from Springfield newspaper records if Mattozzi was ever tried for shooting Rodems. Coal-hauling railroads were the target of dozens of bombs in the PMA’s campaign to force central Illinois mines to contract with the Progressives. One of the most serious took place on the Chicago & Illinois Midland railroad line near Andrew, north of Springfield, on Feb. 24, 1933. Eight cars were destroyed and four others damaged by the bomb, which investigators determined had been placed between a gas tank car and the car head and set off by a timing device. The C&IM train was “the fourth to be wrecked in Sangamon County during the last few months,” the newspaper said. Only eight days earlier, 113 sticks of dynamite had been found on the same railroad, the newspaper added. 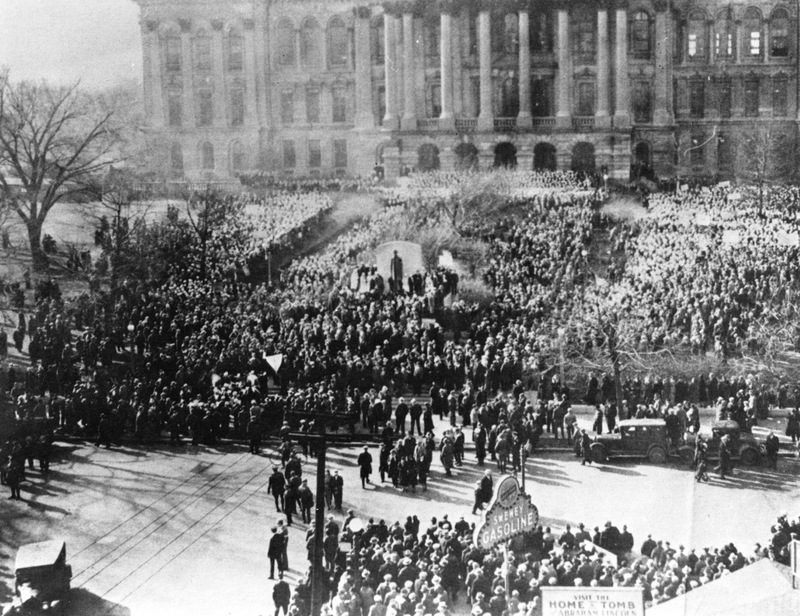 One of the signal events during the PMA’s heyday was a march by an estimated 8,000 members of its women’s auxiliary — “the largest demonstration by women marchers ever in the city,” the Journal said — to the Statehouse on Jan. 25, 1933. The group, wearing white dresses and headbands, was led by the indomitable Agnes Burnes Wieck of Belleville. She presented a petition to newly inaugurated Gov. Henry Horner, calling for, among other things, a system of unemployment compensation. Horner complimented the PMA women on their conduct — his office had been ransacked the day before by an unrelated group of unemployment protesters — but gave the women little satisfaction regarding their legislative goals. “Where will we get the money?” Horner said of the unemployment insurance proposal. The PMA always faced an uphill battle against the powerful combination of the Lewis-led UMWA and Peabody Coal. The insurgent union remained in existence until 1999, with its national headquarters in Springfield for much of the period. But it never really recovered from the December 1937 racketeering convictions of 36 PMA members in Springfield federal court. Among the defendants were a dozen Sangamon County residents. Included were two of the three men — Art Gramlich and Dan Mataya — who had been charged in the Cox killing (Edris Mabie was already dead). Others who went on trial included Springfield residents John Fancher, PMA vice president, and Dan McGill, a member of the union’s executive board. The charges focused on 44 mine and railroad bombings, mostly in Sangamon, Christian and Saline counties, between 1932 and 1935. A total of 370 witnesses appeared for both sides during more than a month of testimony. Many prosecution witnesses were former PMA members who turned state’s evidence. “There came a time when … the pure purposes which founded the Progressive Miners of America were stultified,” prosecutor Welly Hopkins said in closing arguments. Defense attorneys tried to focus the case on John L. Lewis and on what they said had been improper collaboration between the FBI and the UMWA and Peabody. “Some government witnesses themselves should have been indicted,” said defense attorney Jesse Brown. “… Wherever Ray Edmundson, state president of the UMWA, walked, there were riots and there was trouble. “The UMWA wants to destroy the Progressive union. That is the essence of this case,” Brown said. The trial was a setback to the Progressives on several levels: the defense was costly ($100,000-plus), the convictions decimated the union’s leadership, and the PMA was tainted as an outlaw, violent organization. Harriet Dufresne Hudson summarized the trial’s impact in The Progressive Mine Workers of America: A Study in Rival Unionism (1952). The facts brought out at the trials cost the union the public’s good will. Seeing for the first time a composite picture of the extent to which violence had plagued some mining communities, the public was surfeited with the whole setup. It tended to lay on one union the blame for all the crimes committed in connection with the mine war, overlooking the fact that there were lawless men in both organizations. More than 60 years later, mine war researcher and author Carl Oblinger came to the conclusion that, as the defense had contended, the trial was rigged against the defendants. “The depositions and the trial testimony of the miners show that these people were railroaded into prison by fabrication of evidence, by threats, and by intimidation,” Oblinger told Illinois Times in 2004. The convictions, continuing rivalry with the UMWA, and conflicts between left and right wings within the PMA itself took their toll on the union, and its influence dwindled gradually over the next five decades. As of 1982, according to a New York Times report, the renamed Progressive Mine Workers of America represented only 4,500 miners in five states, compared to the UMWA’s 160,000 members. The Progressives finally closed up shop in 1999. Whether the PMA’s long-term prospects would have improved if it had won its struggle to represent Illinois coal miners is doubtful, anyway. The last unionized coal mine in the state shut down in late 2013. *Springfield newspaper files, which provide contemporary accounts of the PMA/UMWA struggle. Information above on the local fatalities, the women’s march, the Andrew bombing and the 1937 trial is mainly taken from Illinois State Journal reports. *More than a dozen oral history interviews related to the PMA/UMWA struggle done for the former Sangamon State University (now the University of Illinois Springfield) in 1972-73. Included are interviews of Art Gramlich and John Fancher. They are collected as the Coal Mining and Union Activities Project. *Minewar.org., whose wealth of information includes some striking photos and a useful timeline, though all from the PMA side of the struggle. *Harriet Dufresne Hudson’s doctoral dissertation, The Progressive Mine Workers of America: A Study in Rival Unionism, which looks at the union rivalry from an academic and legal perspective. *Divided Kingdom by Carl Oblinger (1991), a collection of oral histories from people involved in the union dispute in Christian County, which provides useful context. *An online history of PMA activity in the Gillespie area, which includes an eyewitness account of the riot in which Detective Sgt. Porter Williams was killed in Springfield. 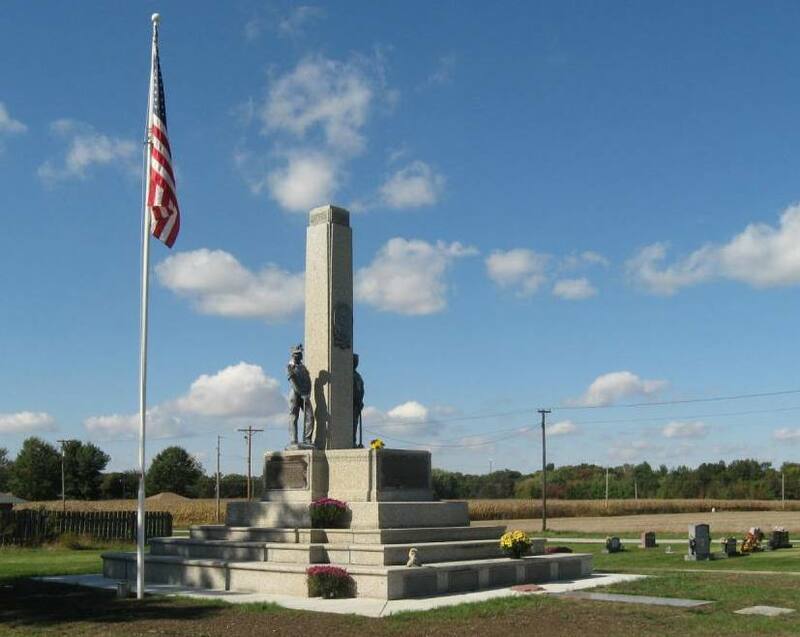 The Mother Jones monument, erected in 1936 in the Union Miners Cemetery in Mount Olive, may also be worth a visit. 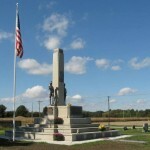 The sunny, windswept monument, which includes plaques commemorating PMA “martyrs” — including Urban, Staples, Mabie and Fred Gramlich — during the union war, is the site of a pilgrimage and ceremony every October. This entry was posted in Coal mines and mining, Depression, Law enforcement, Prominent figures and tagged Progressiver Miners, United Mine Workers. Bookmark the permalink. The security guard killed was Robert Blaine Cox and was my Great Grandfather. Ms. Bee: As the entry suggests above, it’s sometimes hard to pin down information about non-PMA victims of the coal union war. Thanks very much for clearing this up. I’ve updated the entry and given you credit. Ms. Dow: Thanks. I’ll take a look. My dad, Woodrow Wilson from Tilden Ill., was involved in this war and was on the side of the Progressive Miners. He mentioned bombings but said he was in a bar when it happened. And snickered and mentioned long fuses. He also mentioned that during a solidarity parade they were diverted by a state lawman on the way to Colterville and then ambushed. There was gunfire but nobody hurt. Dad was born in 1913 and was only involved for short time and while working as a lineman later he was questioned by the FBI but that was the extent of his involvement as he was later in Washington State with the CCC’s and also did time with the CMTC’s. Mr. Wilson: The ambush your dad talked about took place in January 1933. It was one of the best-known incidents during the PMW/UMWA fight, but I didn’t deal with it because it happened in Franklin County, not Sangamon County. No one was killed, but six Progressive miners were wounded. Thanks very much for reminding us that the miner war extended all over central and southern Illinois. Thanks for the site. My father in law Gerry Allard was an organizer of the Progressive Miners. I am fortunate to have scrapbooks of this history. Is there a history of the mine and workers that worked at the mine on Yates/walnut/JD Jones? I would love a book about that as my great great grandfather worked there in the 20’s-30’s timeframe. Ms. Lewis: I saw your Memories of Springfield Facebook post. The map Chuck Stone linked to there (http://isgs.illinois.edu/sites/isgs/files/maps/coal-maps/topo-mines/springfield.pdf?fref=gc) shows the mine as Panther Creek No. 2, which closed in 1948. I’m not aware of any histories of that mine, but the topic sounds like a good one. Let me put it on my (long and growing) list of future SangamonLink entries. Thanks for commenting. Many of my ancestors were miners in this era. I am learning more each day about the lives they lived. Thank you for this article. I will share it on my genealogy and copy it for my own archives so it will never be lost. So much history is lost for the simple reason a web page lost funding. I miss the good days of books. Was martial law ever imposed during the mine war years? I am particularly interested as to the Taylorville area. Mr. Farrimond: The National Guard was called out several times in Taylorville and Pana to guard mines and/or break up Progressive Miners gatherings, but I haven’t found any indication that martial law — which would have been a pretty big step — was ever put into effect. But it’s possible I missed it — I did kind of a quick-and-dirty search. The Illinois State Journal is online and searchable during the mine war period. If you have access to NewsBank.com or want to subscribe to GenealogyBank.com, you could look in more detail. Unfortunately, neither the Taylorville or Decatur papers from back then are online. My grandfather, Andy Gyenes, was a mineworker who was shot and killed by a National Guard as my grandfather exited a neighbor’s home. My dad, who was 9 at the time, saw the whole thing. I have a few photos from the funeral and even accidentally found footage posted on YouTube of my dad, aunts and grandmother in mourning. It appeared to be raw footage of the aftermath of the strikes in Taylorville, Illinois. Five thousand people attended Andrew Gyenes’ funeral, which was held in Pawnee to avoid the National Guardsmen who were patrolling Christian County. He is buried in Taylorville’s Oak Hill Cemetery. The Peoria-area Guardsman who shot Gyenes was acquitted in a military court-martial held in Springfield. He said he had warned Gyenes he would shoot if Gyenes did not submit to arrest, but that he had meant only to wound Gyenes. Thanks for the comment, Ms. Diegel. I have quite a few photos from Andras Gyenes’ funeral, a panoramic photo of the participants, which includes my grandmother, from the PMA Women’s Auxiliary march to the statehouse, and a booklet from the military court martial of the Guardsman who shot him. Is there an historical society or local organization that would give these items a good home? Does the University of Illinois have an historical collection these items could become a part of? Ms. Diegel: The Sangamon Valley Collection, the local history collection at Lincoln Library, Springfield’s public library, would definitely be interested in at least some of your material. Contact Curtis Mann at 217-753-4900, Ext. 5634 or 5632. And thanks for reading.